Did you know that Elisa and I recently ran in our first 5k since each of us had a baby. 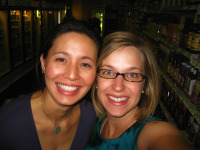 Hats off to Elisa who is less than 5 months postpartum. You go girl! I’ve had 2 1/2 years of “recovery” since Calvin was born, but I just haven’t had the gumption to sign up for a race…until now. For the record, Elisa and I both agree that races should offer a race award category for moms with small children. Because the lack of sleep, on call 24/7, and breastfeeding support of a little one is one heck of an endurance wear on a woman…who will then attempt to run a race. Whew! Elisa and I RAN. We ran for ourselves. We ran for our guys. We ran for each other. We ran for autism. The Race for Autism 5k, supporting the Virginia Institute of Autism, took place on Saturday, April 17th. We had perfect weather and a gorgeous spring day for a route near McIntire Park in a lovely neighborhood in Charlottesville. Out of 465 runners, we finished 290 and 291 with a time of 34:54. Not bad for a couple of mamas who didn’t even train for this event with running (and who were pretty sleep deprived). Elisa’s been working out at ACAC on the elliptical trainer and taking some of their aerobics classes. I did a month of Crossfit’s On-Ramp class plus some kettlebell squats and uphill sprints on my own, but neither of us ran much prior to the race, and we certainly didn’t run 3.1 miles since birthing our sons. We felt pretty exhilarated afterward because we finished . . . respectably. For the race, I wore my new Mizuno’s Wave Elixir 5’s (courtesy of Mizuno USA). I’m going to make a confession–I only wore them for a few hours of walking a couple days prior to the race. I didn’t adequately break them in (not something I’d ever do or recommend). Guess what. It didn’t even matter. My feet felt comfortable, supported, and blister-free. Perfect amount of arch support, mid-range control, and adequate room in the toe box. I felt as smooth on the downhill as on the uphill climb. Plus, they’re really pretty with the silver and red accents. Mizuno Wave has been my running shoe of choice since I used to run 3 to 7 miles a day several times a week before I became a mom. It’s still my go-to shoe for running. LOVE it. Super light (7.7 ounces) and super ride. The Mizuno Wave Elixir 5 retails for $95 – $105, and they are available at most running shoe retailers and Amazon.com . Thanks to GoLite who creates high quality performance wear that’s easy on the planet. Simple and clutter-free (gadget-free) is their philosophy. I love so much of what this company stands for, and I was thrilled to wear GoLite’s Tilly Jane running skirt for the event. It was my first running skirt. I’m never going back to running shorts again. Ever. 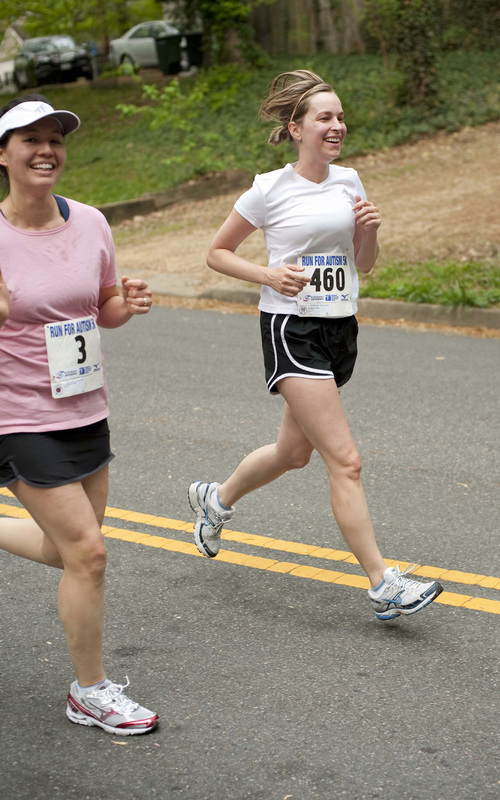 I always felt like running shorts would get bunched up and awkward while running. Not so with the Tilly Jane. This stylish and svelte running skirt features a hidden boy short with quick-dry material in the event you need some modesty while you’re doing warm-up squats prior to your run. Plus, there’s a dandy hidden pocket to stowe your lone key or I.D. while running. It’s totally comfortable from breathable fabric that moves with you and doesn’t ride up. Plus, I think it looks way more cute than shorts during a workout, and it’s definitely way more feminine. Not that I’m overly concerned about those things. The semi-fitted Tilly Jane is available in X-Small through X-Large. Three colors are available: Black/granite (what I’m wearing), granite/jade, coral/granite. The Tilly Jane is made from recycled polyester, elastic, and Minerale materials, and it retails for $60 on GoLite and Amazon.com . GoLite also equipped me with a hydroclutch. 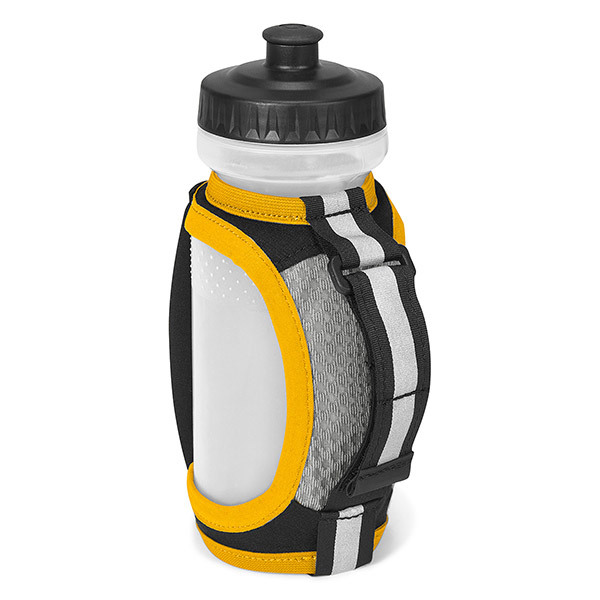 Think cycling water bottle with a reflective hand-grip for runners. So, you don’t have to actively “hold” the water bottle while it’s strapped around your hand, and you can bring your water with you. Note: I received a pair of Mizuno Elixir 5 shoes, GoLite water bottle, and skirt for the purposes of this review. Welcome to a weekly series on Traveling with Baby, wellBEing weekends, formerly known as Health Happy Round-Up. 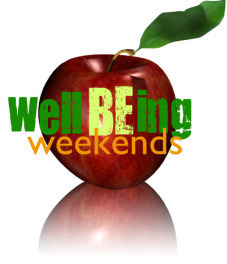 Each weekend (Friday – Sunday), wellBEing weekends will feature health-related news, recipes, and fresh tips on wholesome health for your family’s well BE-ing. I’m getting back into the groove of the regular columns on Traveling with Baby after taking a hiatus from the Valentine’s Day Gift Guide. If you missed out on the great prizes, never fear, we have more gift guides lined up for Mother’s Day and Father’s Day! While Calvin’s napping, I’m going to use Elisa’s recipe for yummy banana bread, but I’m going to use a gluten-free flour combo of buckwheat and brown rice flour. It’s the perfect thing to make with several bananas that are over-ripe! Actually, we’re going to make a more concerted effort to feature delicious and healthy food recipes on Traveling with Baby. If YOU have a recipe you’d like to share, please e-mail me [drgarnecki at gmail dot com]. 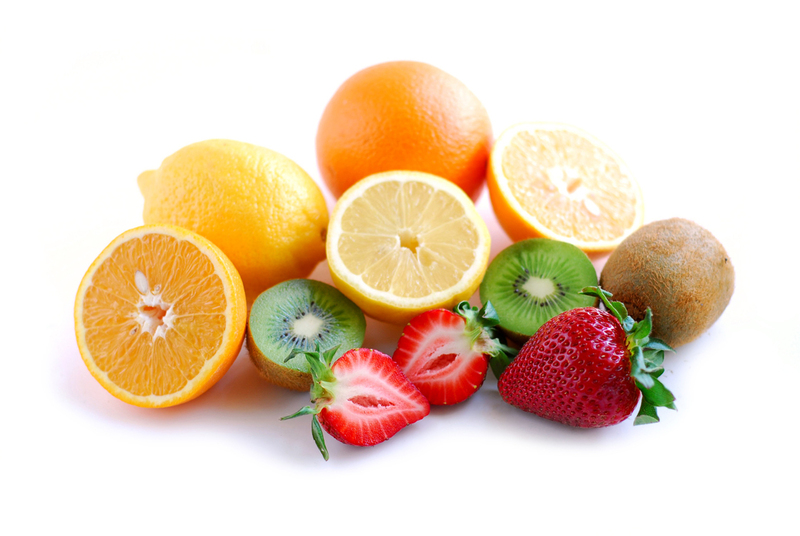 We’d be happy to feature YOUR great foodie ideas for healthy and delicious meals and snacks for the whole family. Last month, we talked about ways to engage in fitness as a family. A lot of that family fitness stuff got put on hold when we were dealing with an indoor flood, immediately followed by Snowmageddon. Boy, did I get a lot of cleaning and furniture rearranging done! Turns out Elisa B did the very same thing. If women and children are stuck inside for days on end, we can be VERY productive! Although re-organizing our tiny living space was a plus, the lack of sunshine and ability to run outdoors was KILL-ING me. My son was asking every 5 minutes of every day to “go to the playgwound to play with tids”. Thankfully, a few “tids” came to visit us at our home and at the office, so my son’s developing social cravings could get met. Back to the fitness thing…lifting heavy furniture and boxes was a great workout. However, I am yearning to run. I’m so eager to get back to it that I’m setting a goal: a 5k race in mid-April. I’ve been asking my women running friends to join Elisa and me as we run and train to complete our first 5k race since both of us were pregnant and had our sons. I have not run in a race since 2006…it’s been too long. The Race for Autism is raising funds for the Virginia Institute of Autism–a day-school and resource center for families and health professionals on autism. 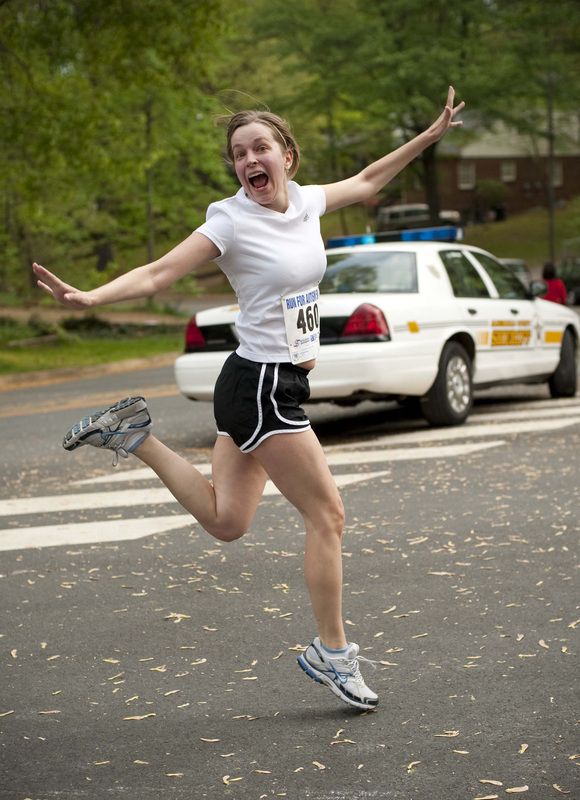 Charlottesville Moms, will you join me in training and running in this 5k on April 17th? This race is a great opportunity for you to promote family fitness by living as the example, and you’ll help raise money for an organization that is working to help families with autism–a condition that affects one in every 150 children in the United States (according to a survey by the Washington Post). We’re going to create an exclusive Team Traveling with Baby // Team Bridal Ring running shirt (it will be pretty and flattering) for all the gals who join us for this upcoming race. First, register for the race (it’s only $20 before the day of the race), then leave a comment that you’ve done so, and that you want to participate on Team Traveling with Baby. Next, we’ll keep working on the design for the shirt that you can pick up and wear on race day. Are you excited? I am SO excited!